It has been a nasty wet day here in Kentucky. It has rained the entire day. I kept waiting for the rain to stop to go and check our mail, well guess what, it didn't stop. So I went to get the mail anyway and got soaked (guess I should have used an umbrella!). Took my little dog Jake with me and of course he went thru every mud puddle he could find...he's a little meanie sometimes! I made some chicken chowder this evening, it is so tasty and pretty that I had to take a picture. It will warm you up on a cold day. It is an Amish recipe and so easy. Already done with my 2 Sketches 4 You card this week, is anyone impressed I'm so early? I am! Seems like I take all week thinking about what I'm going to create! But this week the card came together in minutes and I just love when that happens, because it is a rare thing! I used Colorbok, Melissa Frances, and DCWV paper, K&Co. and Making Memories Embellishments, Michaels Ribbon, and buttons. I loved this week's sketch, thought it was fun and a design I can use over and over. Fabulous card Amber, love the buttons! Awesome take on the 2s4y sketch this week! Yummy! Your chowder looks so good and you get to eat the bowl too! 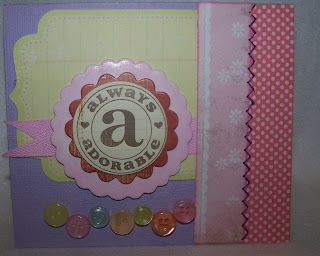 I love everything about your card, the chipboard, buttons, paper - Great job Amber!! Ok, Amber....that chowder looks fabulous! Love the bread bowl. What a food for the soul looking creation. And your card is adorable. Love the stitched detailing and the fun ribbon treatment, and the buttons are so cute. 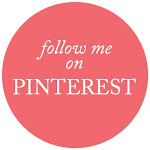 Love buttons on a project. Hope it stops raining for you soon. I know in general we can all use all the rain we can get, but it's always so gloomy, isn't it? 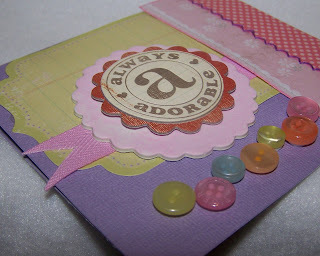 What a lovely card Amber, love the soft colours and the button trim. I was the same as you with the sketch - my card came together so easily I ended up making 4! 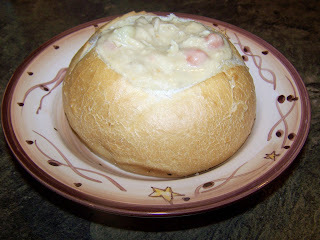 Your chowder looks delicious, love the bread blowl! And I just spotted your kitten in your previous post -oooo what a sweetie! She's so cute! Mmmm, I can almost smell that chowder! Your card is darling! I love the colors! Great take on Lara's sketch! Really like your take on the sketch and those buttons look so cute the way you lined them up!!! such a sweet card, Amber. The buttons are the perfect touch! And your choder looks divine. I'd love the recipe. I love anything Amish! How cute! I love the colors you used! The card looks like it popped off the wall of Abby's room!